The 12th edition of IIJS Signature kick-started in a grand manner yesterday here in Mumbai at the Goregaon Exhibition and Convention Centre. Guest of Honour Dr Subodh Agarwal, Additional Chief Secretary, Industries, Government of Rajasthan presided over the inaugural ceremony. Also present were Pramod Agrawal, Chairman, GJEPC, Sabyasachi Ray, Mansukh Kothari, Ashok Gajera, Shailesh Sangani and Kirit Bhansali. Pramod Agrawal praised the support lent by the Ministry of Commerce under the leadership of Suresh Prabhu. “Suresh Prabhu has always been open to ideas is ever willing to support our industry. With his help and the assistance of Davendra Fadnavis we are in a position to open the jewellery park. Rs 13,000 cr has been invested in the park and we are expecting Rs 14000 cr turnover, which will attract over 3 million jobs and increase g&J exports,” he added. The Chairman also announced that the GJEPC has started a toll free number for its members; to help them at any given point and address any concern they might have. Dr Subodh Agarwal insisted on the importance of technology for growth. “With technology, skills are changing and they are changing faster than you are acquiring them. Human mind is trained to think linear and tech is not growing linear, the growth is exponential. The person who will lead is the person who innovates. This is one industry that is employment generating to the core,” he said. The Rajasthan state government he said is committed to support the industry, especially in setting up of a state of the art Gem Bourse in Jaipur, which will be one of a kind. Subodh Agarwal also said that the government is working on an omnibus law to boost the MSME sector to exempt the sector from repeated inspection by government departments for some period of time. 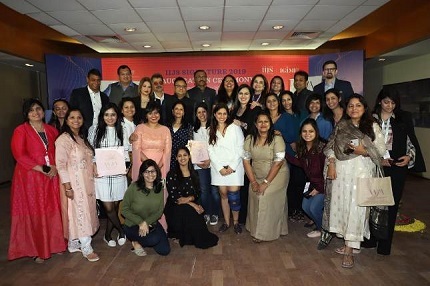 The inaugural event also saw Women’s Jewellery Association’s (WJA) launch of the book ‘Designers of India’ which was presided by Nirupa Bhatt, MD, GIA, India and Middle East.